In my work for NMC, I travel alot, and so I could have net access from the road, airports, and to save on those nasty hotel internet fees, I signed up for a mobole wireless internet plan from the Alltel store in Scottsdale. I took my MacBookPro laptop with me, and was assured that the Franklin CDU550 was compatible, which it clearly is according to the manufacturer’s own web site. At the store, they provided me printouts of the set up instructions from the EVDOInfo.com web site. I used it around Phoenix, up at my home in Strawberry (a remote town 90 miles north of the city) on trips to San Francisco, Austin, San Antonio, even in Vancouver Canada. In March of 2008, I was in Austin for a meeting, and the wireless signal in our hotel was too weak, so I attempted to use my Alltel card. For more than 10 times in a row, the authentication failed. I spoke to someone in tech support, who saw that my account had been “suspended” and transferred me to someone in the account department. This first person claimed my account was being held for “excessive roaming charges” which made no sense as my plan was a national one. Now at the 35 minute mark into trying to figure this out, this woman claimed I would have to go to an Alltel store to have ti fixed. this was ridiculous, as I was in a different city, had no transportation. I hung up and called back and got a different representative, who did more investigation. Apparently, there was a “miscommuncation” with the Sprint tower (where I was apparently Alltel uses the Sprint network). This woman activated my account, and told me how my office could get credit for the $300 zing coming on my bill. It worked okay for the rest of the trip. Later in the month, I was in San Francisco for a short meeting, and in the lobby of my hotel near Union Square, my connection disconnected my right in the middle of a file upload, and lost all of my work. I was unable to reconnect in 8 more attempts. The tech I got at 10pm told me there were “issues” with timing out from using the Spring network, but I would have to call back in daytime to speak to their advanced tech support. So Alltel provides limited tech support. On a longer trip in April, I was unable to connect in Orlanda. The tech I spoke there, mentioned for the first time a “PRL” file which contains a list of the towers the card uses. If I was on a PC he could fix it, but as I was on a Mac, he said I’d have to be in my home area. Another city where I had no Alltel access. On the way from Orlando to LA, I had a plane change in Houston. Here too, my attempts to connect failed. I was watching another guy on a Mac enjoying no problem connectivity on his Verizon connection. that evening in LA, again I could not get a reliable connection. I paid for hotel internet because I had to get work done. it also did not work in San Diego. Alltel Wireless Internet gives you fast wireless access to the Web and your corporate network from the convenience of your laptop or smartphone. Whether you’re using a smart phone or your laptop with your phone as a modem or a data card, staying connected has never been easier. On their phone, the hold messages talk about their national network. Hereps the news– Alltel does not have a national network. They have patches and leach off of Sprint’s network (and they do that poorly). I want out of my plan. I have not gotten the service they have charged for. So I called them today. I got to tech support. The first guy kept telling my to “open the Quick Access app from your Windows toolbar, press control D” and it took 3 times for me to say, “I am on a mac, there is no software”. While explaining the problem, I tried 5 times to connect and each time was disconnected a little over a minute into the connnection. He transferred me to an “advanced” technician. After I explained the situation again, he asked for my account information, and while waiting for him to look it up, I was disconnected on the phone. Please connect me with someone higher up on the food chain. “They cannot do anything beyond what I described”. Please connect me anyhow. More wait. More happy music on hold. This time I got Omar. I told Omar the whole tale. He asked what it would take to keep my a customer. I said, ‘nothing, I dont want to be one. I want out on my contract.’ He said I’d have to pay, but he tried to convince me the tech department could fix the problem. I explained I had already been cut off once today, and asked if he would take my number in case it happened again. He said he had it from caller id. I transferred me. I waited, heard some hold music, and… got disconnected again. I am now at an hour wasted. I call the main Alltel number and zap the 0 button repeatedly until I get a human. Jennifer. I let her know upfront she is dealing with the most angry Alltel customer. She is the first compassionate voice, I hear her typing notes. She says she cannot promise that I can escape my contract. She says she will stay on the line and connects me… back to tech support. I tell the story for the fifth time. Ronnie is the first person wo says he knows what to do, that he can “push” the PRL data to my connection (which has amazingly stayed on for 20 minutes). He is typing away and tells me it will take 15 minutes. He asks me if I can standy by, and a few minutes later he returns and says… the device I am using is not compatible with the Mac OS. This is most interesting, as (a) it was the equipment sold to me by an Alltel store; and (b) for an incomaptible device, it worked great for 4 months, and was working right then. I asked him to put in the notes that the device I was sold was incompatible as justification for escaping my contract. I was then transferred.. to the retention department where again I got the $200 speech. I hang up, and start over again to the main number. I request Jennifer, but the new person claims she can help me. I tell the story again. I let her know I am livid. She starts saying I need to talk to tech support. I say no. They cannot support me. I demand to speak to a person who can make the decision to terminate my contract w/o a fee. She said that is not possible. I again explain, in halting voice, the definition of a contract– an agreement on both parts to pay a fee for a service provided. No service.. no fee. Now I am yelling loudly. Very loudly. This does not really work. I demand to speak to person who has some authority. She says she will…. and transfers me to tech support. I gave up. I wasted two hours. 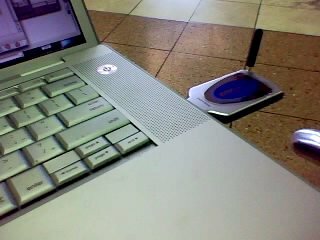 So I am done trying to get Alltel’s rubber band network to work or for the inept tech support to provide tech support. The only thing I will accept at this point is a termination of the contract and I am not paying any fees. I want to use a real wireless network like Verizon– hey Verizon, if you can help me escape Alltel, I will become a walking, blogging advertisement for you– get red of the “Can you hear me now geek” and sign up the CogDog spokesman. It cannot be legal for Alltel to charge to end a contract which they have not fulfilled. 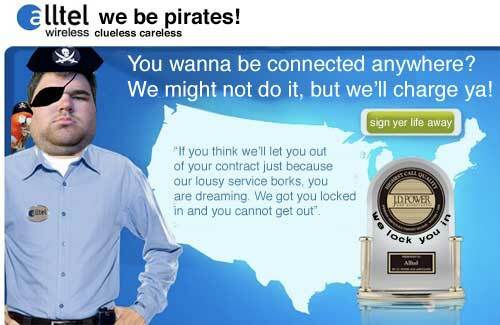 So I want everyone to spread the word about the nasty smelly evil pirates named Alltel. Let ’em know they cant get away with grinding individuals under their giant wheels. They have played with me and I have had enough. I am going to pull out every stop I have, call in every tech favor, get some publicity, reach out to every social network, to bring Alltel down. Please help me escape the heavy chains that Alltel has placed upon me. Set me free. And burn their ship down. I spoke to 9 people today, got disconnected 3 times w/o a call back, and your “Retention” department is claiming that I cannot get out of my contract w/o paying a $200 fee. Alltel has failed to provide the service in their contract that I have paid for. YOU have failed the terms of your contract. YOU are NOT supporting equiopment YOU sold me when I signed your contract. I REFUSE to pay to pay any fee and ASK that you come to your senses before I begin a media and legal campaign. On the way are letters ot the Better Business Bureau, the Arizona Corporate Commission, and the Attorney General’s office. So far, I have spent well over 6 hours of my work time trying to get customer service, and I have gotten none. This is your last chance to do the right thing. I apologize for the problems you’re having. If you want to work to resolve the technical issues, you can contact our support line at 800-255-8351. If you wish to cancel your service, you can talk to our retention group at the same number. Alltel Jail Update Apr 25 4:00 PM: No food or water in the Alltel Jail. I must be crazy, but I have an idea. If they can only support this wireless card on a PC, I will test it out on my Windows Vista machine. I installed the software, and tried 12 times to connect, each time failing authentication with “PPP Control Link Terminated”. SO I call Alltel Tech Support. I am at level one, and explain the problem. The first gal is nice, takes my account info, and then says, she cannot help me, so I am sent to another level. Here, I again have to provde my account info, and explain the problem. She walks me through all kinds of things on my network, modem settings. We actually get it to connect but it immediately disconnects me. We spent 35 minutes trying settings, waiting while she checks with other techs, and she apologizes and transfers me to someone in ther network data center. For the third time, I have to provide my account info, explain the problem. This person says he is checking, then says nothing, but I hear tapping in the background. Five minutes go by in silence… and I realzie I have been disconnected. This is the 4th time in 2 days that Allrel tech support has disconnected me in the middle of a support call. So I call back. Like chutes and ladders, I am level one. I explain the problem, and then go to level 2. I explain I have been cut off from the previous technician and ask if they can call back if I get disconnected. He says they are discouraged from making callbacks because of their call volume. Let me get this correct- Alltel Support will not follow up with a customer who has waited an hour for serivice because Alltel’s phones (and they are telecom provider!) fails. He clicks around, looks up some things, asks for my zip code location, and tells me it is an issue of being between Alltel and Sprint towers. So here is the deal. Alltel advertises their nation-wide network- but they aren’t nationwide. The do handoffs to/from Spring. Tech number 5 today could not help, so I went to number 6. Gave my account again. Explained the situation again. The first thing I had to do was to shut off my Norton. OMG, there are actually no controls to exit that program! None! I had to disable my non Windows services and reboot. We tried connecting again and I got dumped. Now he suggested downgradiing my PRL file which he emailed to me. He talked me through getting that data to my card. And 90 minutes later, the damn ting actually worked in my PeeCee. But this is not the issue. I pay for a nationwide service that is not reliable- if I am in area that relies on Sprint, my connection can bounce and be cut off. Help! Get me out of Alltel Jail! Please I want Verizon! I will lavish praise on Verizon! They have a network! I have seen it on TV. Please, Verizon, rescue me. Alltel Jail Update Apr 28 9:00 AM: While I languish in Alltel Jail, my spirits are lifted high by the efforts of my friends, who have tried to lob some reason to the Alltel customer support, who seem readily enabled to lob back their stone wall efforts of canned non-caring responses. Check out the letters and it seems plain that there is no appreciation of what the acronym MIT means among the Alltel front lines. Alltel Jail Update Apr 29 10:15 AM: The black pirate ship is not even flinching. They are winning by the sheer dead weight of their ship. They can afford to ignore customers. Eve worse for my case, I must admit after the last tech support person I spoke to (this was number 8 in 2 days, including 3 disconnections while waiting for tech support), the darn thing seems to be working as it did when I first got it. The connect time is now about 15 seconds, where last week ti was well over a minute, and I have logged on easily from Austin. This changes nothing from my feeling of being jailed. Alltel took my monthly payment for 2 months, where their service did not work in 5 major cities, where only 1 out of 15 tech people I spoke to could even provide a solution, where 2 tech people stopped their offer of support because they wrongly told me the equipment they sold me was not compatible with the Mac OS, and not one person offered to even considered as a possibility that I might be freed from a contract that Alltel did not hold up their end of services. It’s likely everyone reading this has experienced similar frustrations with online support. My experience is that once you introduce any element beyond the company policy or handbook, they have no way to respond. It’s interesting as you write about Jennifer having compassion. While still unable to resolve your issue, I wonder why you notice that? To me, I’d rather have someone have compassion, common sense and admit they can’t help me rather than wasting hours on the phone. After spending that much time with customer support and hearing all the company lines, I often feel as if I know everything there is no know since they rarely move beyond their handbook. I was thinking about examples of good customer support and in fact my ISP might be one. They actually walk through issues with me and I give them some bizzare ones and if they can’t help me, they take call me back once they’ve found a solution….so it can happen. A couple hundred thousand of those in a day (we can be recursive, too) might help. They don’t know me by “CogDog” … yet. But they will. Something stuck out in all that Alan. Norton…get rid of it. Avast! has been working a dream and $0. Secondly, always let tech. support know that you are recording the call. They hate to have their recording played to the next level even if it is that your the voice faking it. Thirdly, McDonalds and Starbucks will provide you with ‘free’ wireless provided your able to stomach their cardboard and RatSac vile-crap-thing-they-call-food. Last, but not least. Alltel has a strange ring to it. Why not register dotellonalltel and let a PHPBB forum run loose for a while. Maybe the trick is to remove the borgs at the Alltel end and point them to your community solution. They’ll love your for it and you might just get lucky. (1) I know Norton is a costly resource hog. I use the Vista PC minimally and am looking at zapping Norton. I have NEVER seen software that has hidden all of the controls to turn it off/de-activate it. This is a criminal sin of software design. Pffffft on Norton. (2) Yes on recording. This last one was for my notes as I tend to forget how many layers of customer support hell iI am sent through. (3) My need is to be connected more that free wireless. I need access from taxis, boars, the forest ;-) These cards, when they work, are marvelous as you can connect in almost any urban area, and even where I am now in the mountains 90 miles outside of Phoenix. Its my backup when my cable modem goes south. And its my connection for those wicked airports and hotels that only offer gauged access ($$) to the net. (4) Heee, I dont think I want to help Alltel improve their customer service. It is beyond hope. I want customers to take their business elsewhere. I am also a Customer Of alltel My contract ends with them may 8th. I called them and they cant tell how much I will owe them I just wanted to get an Idea. I can not wait to be through with them. I will help by stumbleing you hope this will work out for you keep it up found you on twitter. And thanks for the warning to all. I think we should all tell on them. We’re doing what we can. Here are three email address to which you should all write!!!! Pete- it usually costs you $200 to break a contract. Not that it costs them anything to do this, its just a way to “retain” you as a customer. I for one, would be retained by a company that provides me excellent service, than one who penalizes me if I am dis-satisfied with their service. Wake up Alltel, you are operating in the manner pionneered by the 19th century robber barons. Unfortunately, all of the wireless companies do this, so it is not always better over the fence. In many ways, they are all pirates. I only wish we had some sort of over-sight for these companies, but their lobby power $$$$ is much more than you and I. I have learned that the Arizona Corporate Commisssion has almost zero influence over wireless companies beyond hitting them for slamming. I am looking at the Attorney General’s office. Devon- you are promoted to senior Pirate Fighter Mode! I vowed never to use Alltel after a friend told me that she had a bill for $500 in random “fees” and “charges”. We won’t let them get away with it! Alan, Thank you for your post. I have had a mirror experience with Sprint over the last few months. I suspect only you can imagine my level of frustration. Yesterday, I finally caved and paid the $150 fee to be released from hell. But, that $150 only gets me out of the broadband internet contract, not the voice line. Argh. I should send THEM a bill for all the time I have spent trying to get issues resolved. I had a similar experience with tech support for my 97 yr old father’s Westinghouse TV. The video board went and I had to send it in for repair. After one month of stories like it is hard to get parts out of China and one month of being told it was in shipping but it would have to be elevated to a supervisor to find out when it would be shipped- I lost my cool. I sent an email complaint to their PR guys and referenced their CEO who got his degree where I work. I assured them that he did not learn this type of customer support here! 5 minutes later I got a call from the head of “customer care” and in 24 hours a new TV was Fed Exed to my dad. I had a similar experience with my new toshiba TV that arrived NOT WORKING. over 2 months and run around service calls where they refused to fix, replace or refund our money. We finally had the original online store refund our money and we got an LG tv instead. I feel for your plight! I vote for calling your local TV consumer segment. I know it sounds boring and un-anti-establishment, but have you considered contacting the Better Business Bureau (http://welcome.bbb.org/)? I have used their service to mediate a dispute before, and they were able to resolve it when thousands of hours on the phone had failed. It sounds like you have a legitimate claim and can clearly document the case. You’ll just need to decide what a ‘fair resolution’ would be (and ask for a bit more than just “set me free for free” at this point). Let me see if I understand the issue completely. You are an idiot right? I experienced issues with AT&T/Cingular which offered horrible customer service when my contract was up I signed up with Sprint. Sprint offered me spotty service. When my contract was up I signed up with Verizon. That was when I realized I might actually be crazy. Verizon is HORRIBLE. I paid EXCEEDINGLY HIGH monthly fees. I had lots of minutes but it just never seemed enough. FINALLY I got smart and signed up for Alltel Service. I now pay a regular monthly fee, have plenty of minutes, 10 numbers I get to call as often as I want (even my friends that don’t have cell phones are part of the freebie numbers) and lastly, I can’t remember the last time I had a dropped call. You understand perfectly- I am an idiot. Wow, at least someone knows. No, I am not. I am not talking about their phone service. I have actually been with Alltell (actually the company that took over) since 1996. I even wrote nicely about their flexibile plans, when I had to change to an international plan for a month where I was in Canada. I am not writing about their voice service, but their internet data service. To be honest, you will find horror stories with them all. But there is no reason for them to hold you to contract terms where they do not provide the service the contract is written for. You know what? There’s a “This American Life” (radio) story that is VERY similar to what you have related, only hers is about some regular kind of phone service from MCI, not data service from Alltel. One of the funny parts in that story is that the customer service place claims they don’t have a fax line, also the line about “we can’t call you back”. and listen to “On Hold, No One Can Hear You Scream.” Maybe you could enlist NPR in your quest, like she did! OMG I thought I was the only one experiencing severe problems…at least that was the way Alltel made it sound. Disconnect after disconnect…The remote computer is not responding…The remote computer is out of order..I have spent more time talking to tech support and advanced tech support than I have spent on the internet these last few weeks and that is only half a joke. Just like has been mentioned, I am told one excuse after another…”It must be a program conflict with your pc.” So I ask, “Which program?” Answer, “I don’t know, I just know the Alltel system…towers, wires, data etc.” Oh really? Thanks for the help!